The scanner does everything that is required. The initial setup is a bit tedious and lacks any plug and play system while installed on a Windows 7 machine. The ADF draw is also slightly slower than expected scanning roughly 8-10 pages per minute and the only way to do double sided is to flip the document manually. However the scan quality is fantastic even in full colour. I would give this a 2 Out of 5 based on the fact that I bought it thinking that the speed was good and find it lacking. 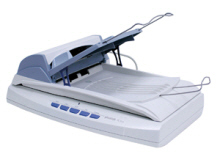 The Plustek PL806 ADF document scanner, a new member of Smart Office series, offers high-speed scanning capability and compact design, making it a perfect solution for workgroups and other decentralized scanning applications. Plustek PL806 ADF scanner provides a maximum scanning speed of 8 pages per minute, optical resolution up to 600 dpi, and permits identify of large quantities of documents at high speed by built-in Auto Document Feeder (ADF) that holds up to 50 pages per time. The Plustek PL806 ADF scanner is a truly versatile document scanner that puts up outstanding value and high performance, makes it a perfect business and SOHO solution, and enables businesses to achieve high levels of productivity.